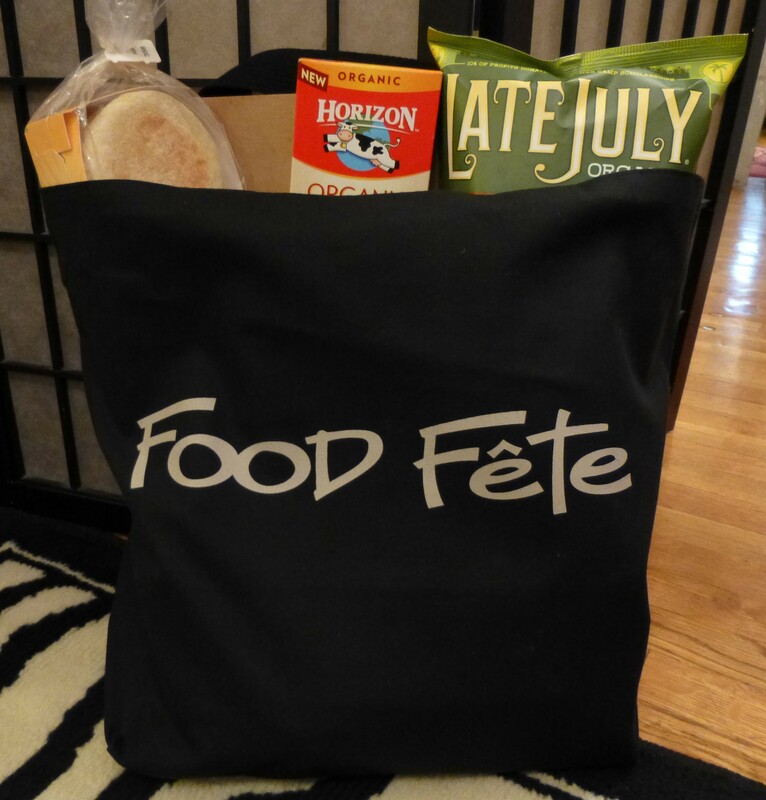 Recap: Summer Food Fête 2014! 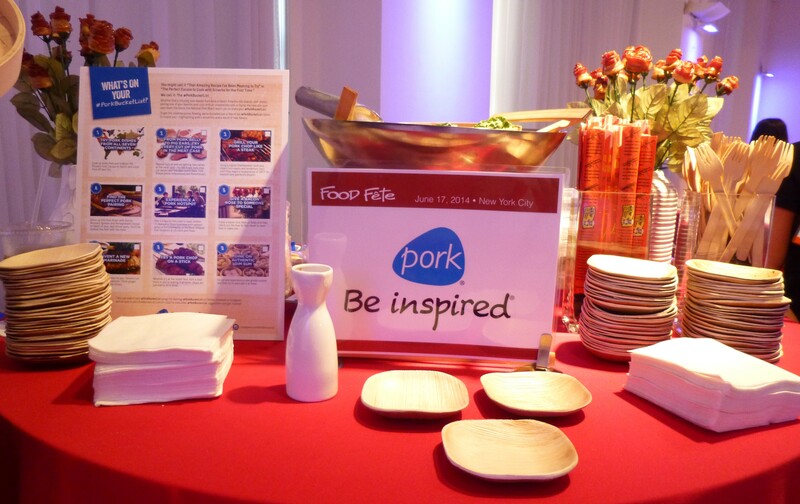 Food Fête’s exciting summer season return to the Metropolitan Pavilion event space on West 18th Street was all abuzz with sumptuous product offerings that ranged from Bacon, Butter and Bourbon to Cheese, Chocolates and Chips! 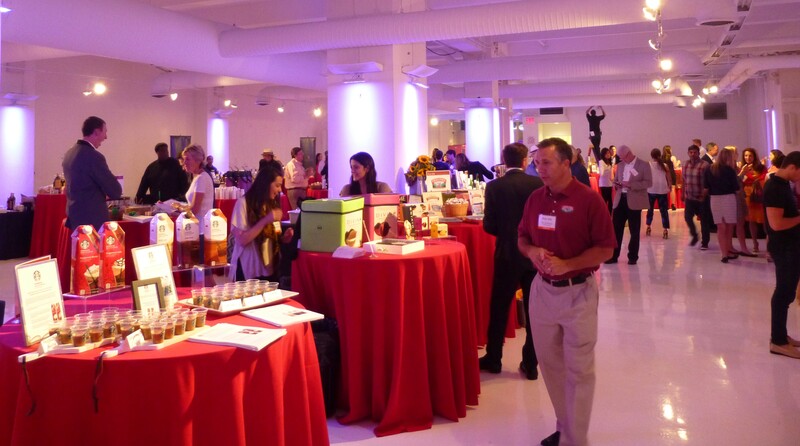 If you didn’t make it to the party, here’s a glimpse of what you missed! PorkBeInspired.com cornered some prime real estate by occupying the first booth attendees encountered upon enter the room. 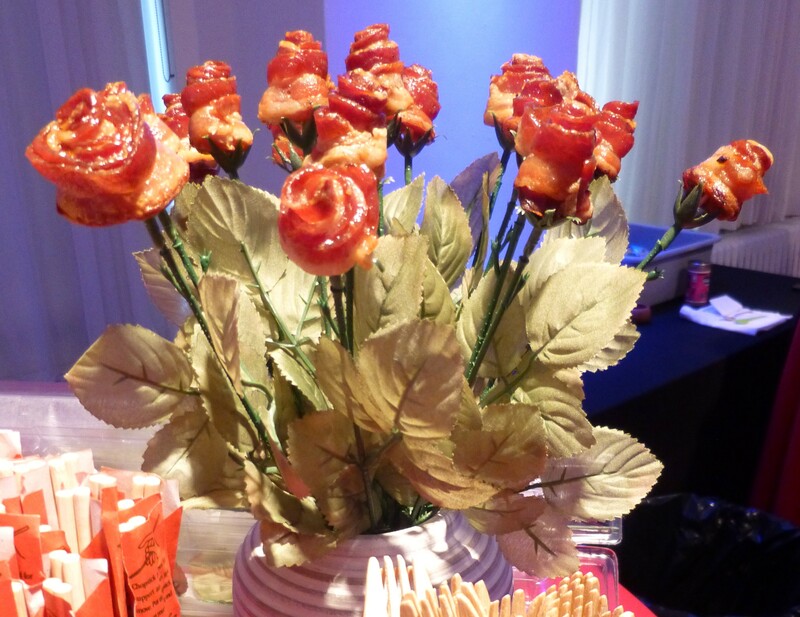 Pork product lovers were treated to a tasting of delicious Pork Dumplings and Bacon Roses (with instructions on how to make those bacon roses at home also on hand) along with a wealth of pork cooking tips, recipes, a guide to identifying cuts of pork, the Pork Bucket List (#PorkBucketList) and a free handy meat thermometer. What a great way to start out the show! 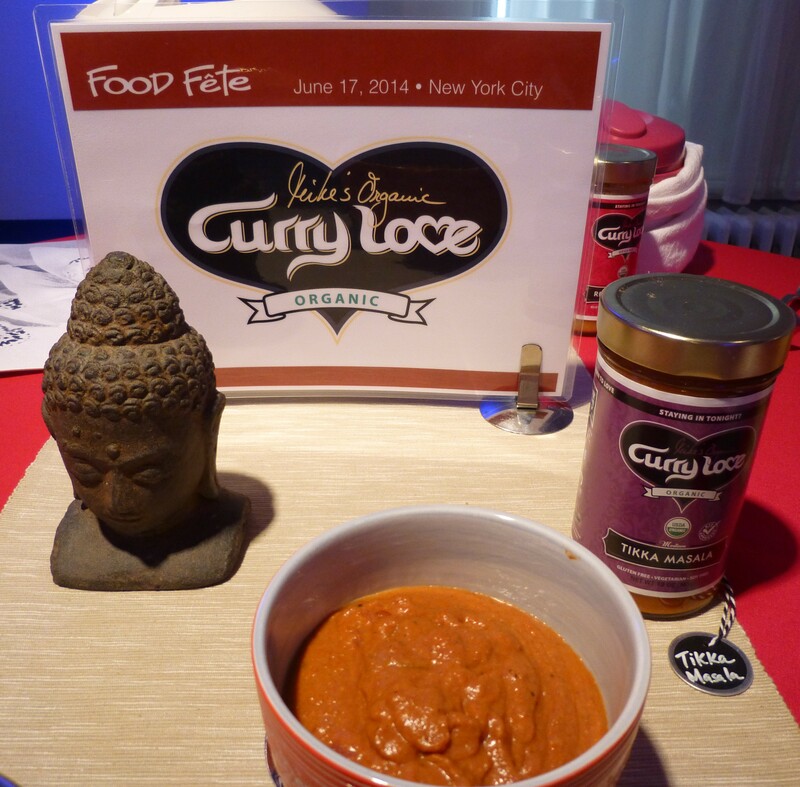 Mike’s Organic Curry Love has a line of gourmet jarred curries that will blow your mind! Flavors include Green, Yellow, and Red Thai Curry, Saag, Tikka Masala and Caribbean Curry. Mike’s was created by a chef and has been around since 2008. Just tasting these flavorful sauces you can really tell that Mike and his wife Laurie (who are super nice) care about what goes into their product while making it so easy to create delicious curries at home that will rival the dishes of your favorite restaurant. 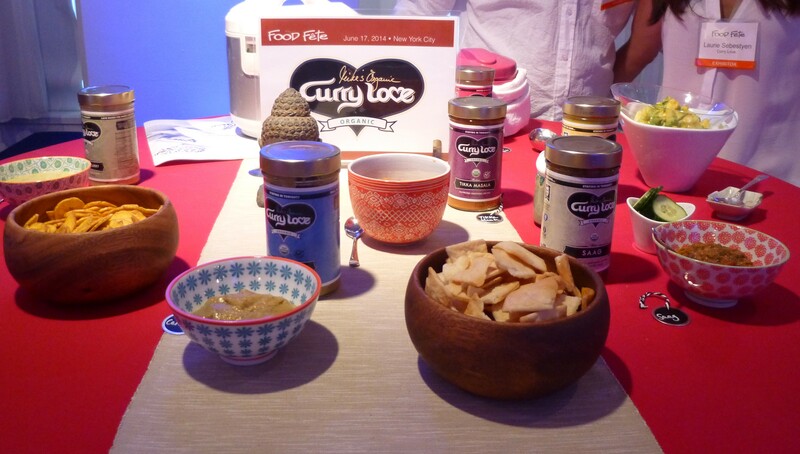 Find out more about their products at My Curry Love Dot Com. You can see Mike and Laurie in the background. I am sorry I cut their heads off. 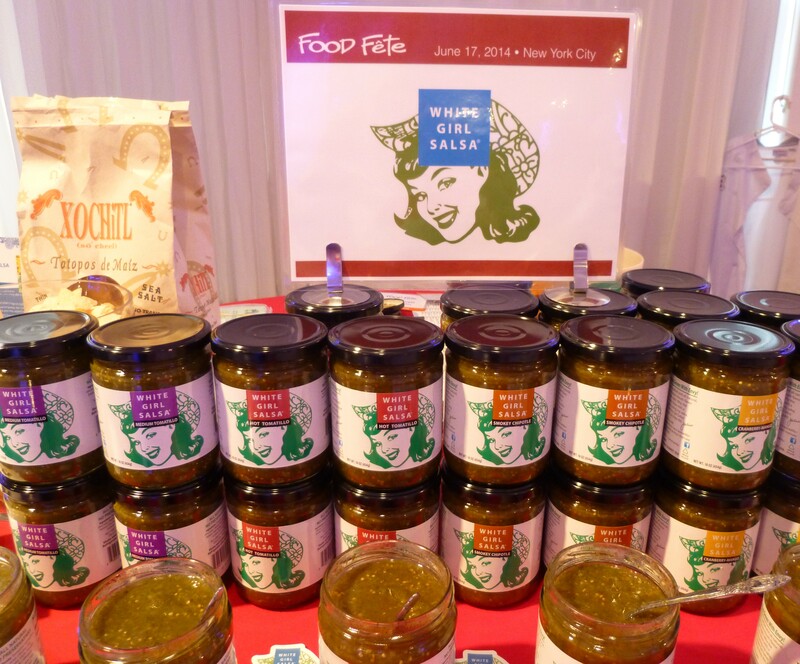 Nobody loves Green Salsa more than this girl, so imagine my delight to find White Girl Salsa – the only company specializing exclusively in Green Salsa – exhibiting at Food Fête! White Girl Salsa comes in five flavors: Hot, Medium and Mild Tomatillo, Cranberry Mango and Smokey Chipotle. Don’t those flavors sound insane? White Girl Salsa is the perfect accompaniment for all of your summer entertaining and backyard BBQs for sure. And look how cute their logo is! Sassy! Get tasty recipes and find out where in 47 states you can buy White Girl Green Salsas at This Link. 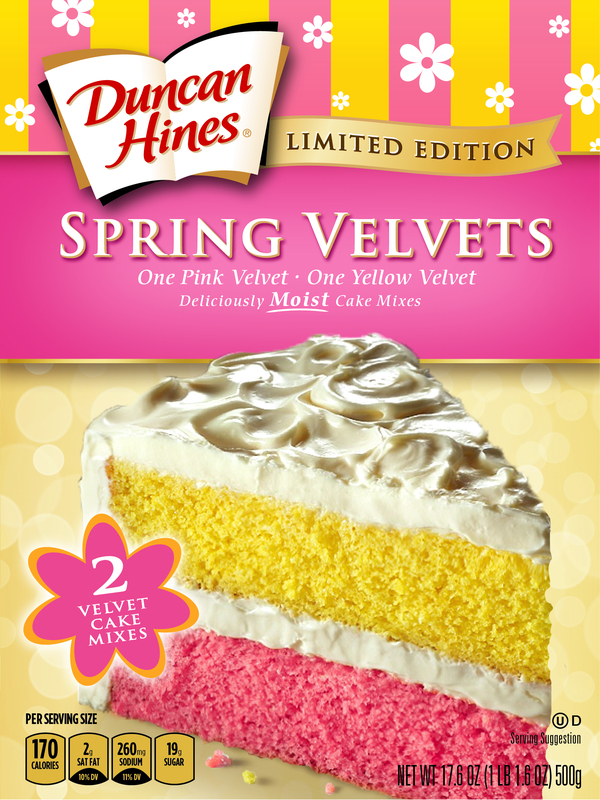 The Duncan Hines Dessert Mix evolution continues as the company whose cakes you grew up loving introduced three new mixes for fall 2014: Limited Edition Autumn Velvets Cake Mix (featuring two seasonal flavors of cake mix in one box), Red Velvet Decadent Brownie Mix (which can also be modified to make cookies), and Decadent Black & White Cupcake Mix (which includes frosting and a pastry bag right in the box)! Duncan Hines‘ all-inclusive mixes elevate home baking ‘Beyond the Box,’ where anyone can make a fancy, impressive and delicious dessert right in their own kitchen. Prices will be super affordable, ranging from $1.99 to $3.29 per box. You cannot imagine how amazing those taste! The Maple Bacon Aioli could easily replace ketchup as a go-to topper for sandwiches or dipping sauce for fries, while the Maple Bacon Onion Jam (a sweet & savory combination of spices, brown sugar, apples, shallots and bits of real bacon) is a versatile pantry essential! What an exciting discovery! 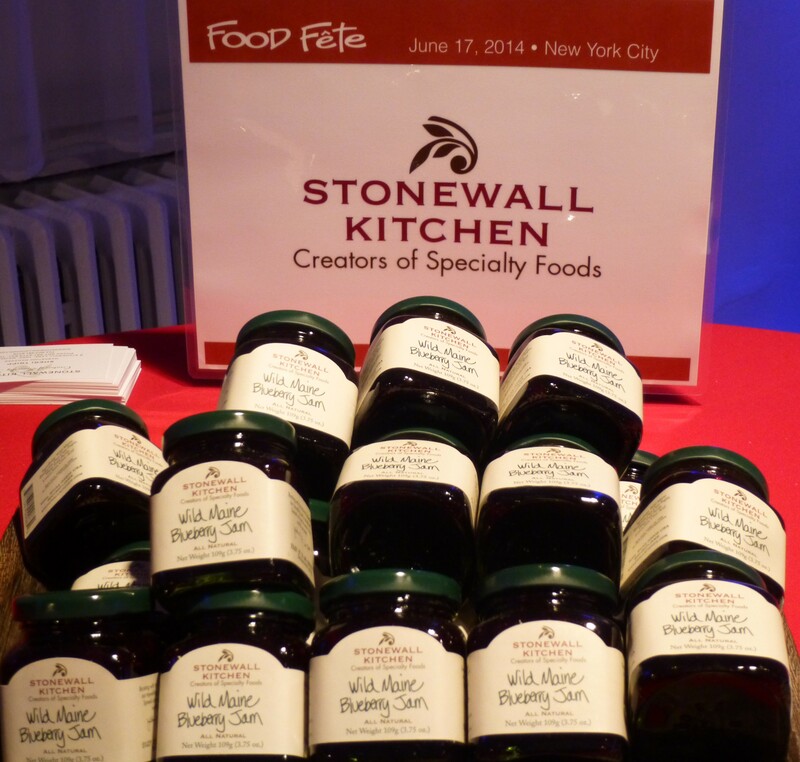 I love how the jars’ labels look handwritten, giving Stonewall Kitchen’s products a homemade, freshly canned vibe! You can be sure that I will be investigating this brand further. 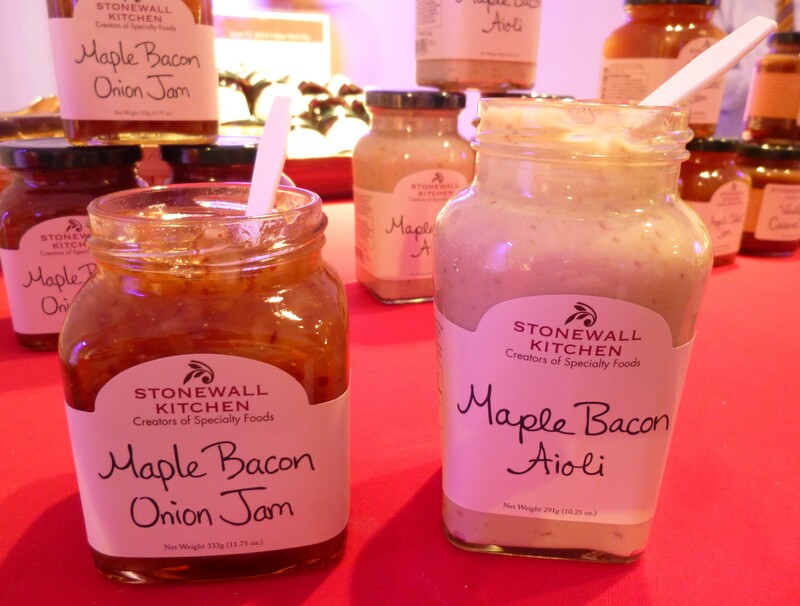 Find out more about Stonewall Kitchen’s specialty sauces and jams, candies, gifts and home products for yourself at This Link. 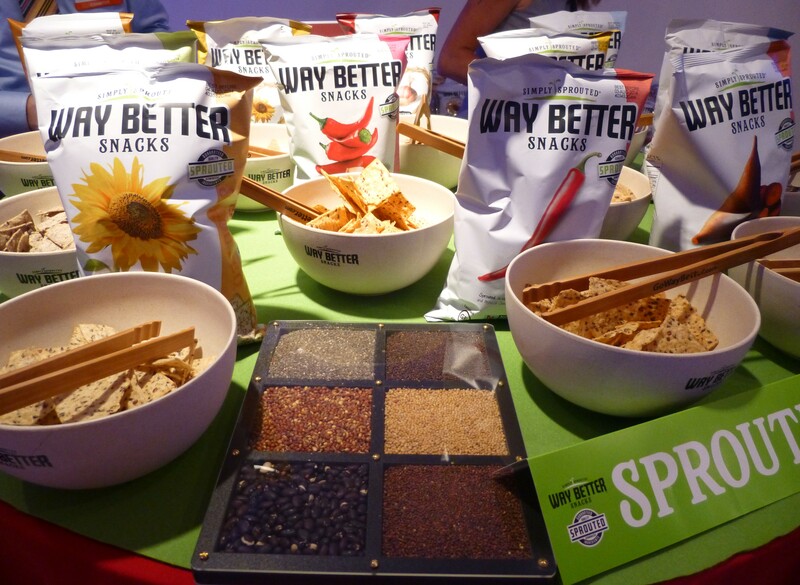 At the Way Better Snacks table, we learned about sprouted snacks and had a chance to sample both the sprouted Corn Tortilla Chips (which, fantastic) and their new Heritage Grains Pita-ahh Chips, which are made with sprouted red fife and spelt. Sprouting provides increased vitamins, minerals, antioxidants, digestibility and nutrient absorption. It is so cool that companies like Way Better are taking a popular favorite snack like chips — usually lumped into the Junk Food category – and making it nutritious and good for you without losing any of the deliciousness you want in a chip. And isn’t their packaging simply stunning? Visit them on the web at Go Way Better Dot Com. 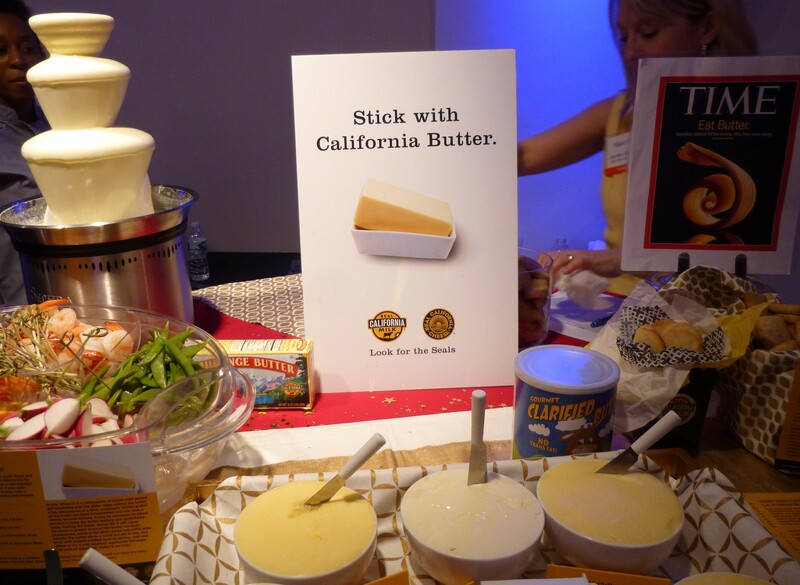 Of course, we had to make a leisurely pit stop at the California Butter Display, because, Butter Fountain. I shouldn’t even have to sell you on Butter, right, it’s Butter! It’s delicious! Read all about why Butter is Awesome at This Link. 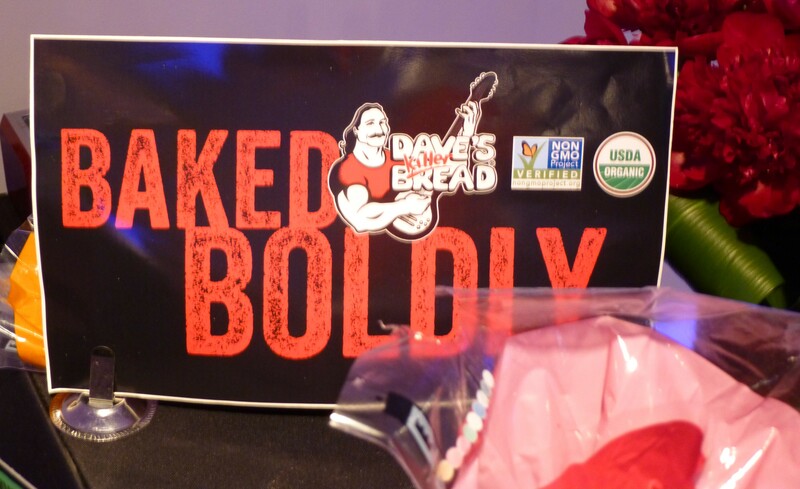 Another product that was new to us at Food Fête is Dave’s Killer Bread, which is maybe called that because the company’s cofounder, Dave Dahl, spent some time in prison. Just being serious. Obviously, he found a way to benefit society upon his release by learning to bake 12 different kinds of delicious, organic, non-GMO breads! 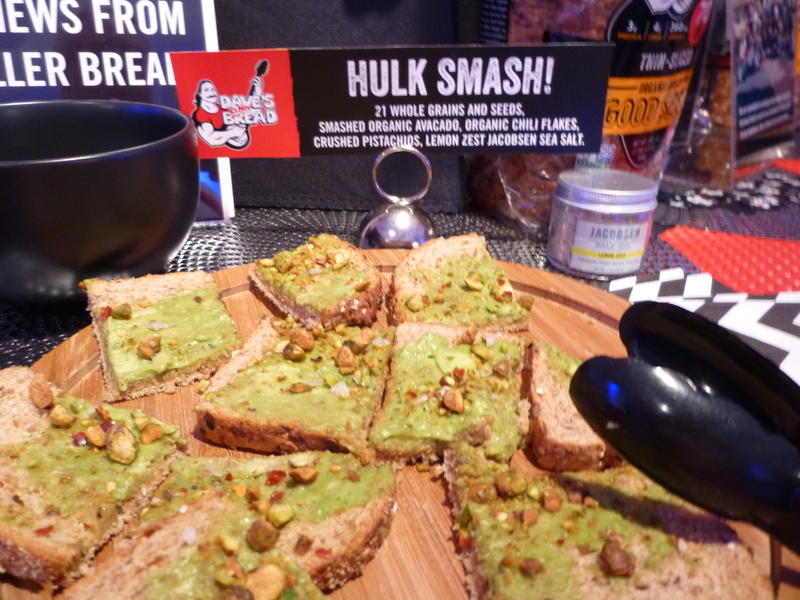 This is what Dave’s Killer Bread looks like topped with smashed avocado and other tasty things on it. Yummy. Dave’s Bread has a moistness combined with a nutty, wholegrain texture that is just irresistible. Explore the world of Dave’s Killer Bread at This Link. 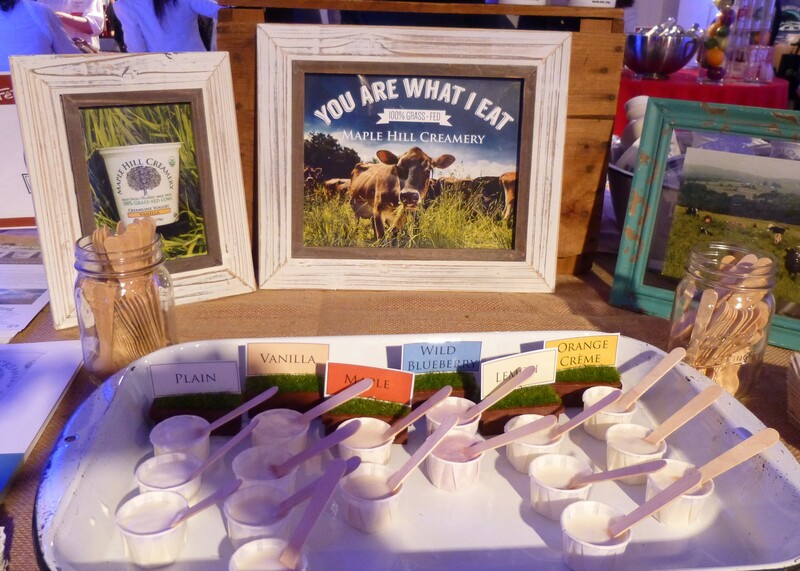 Going with the logic that better dairy products come from better milk (which comes from better-fed cows), Maple Hill Creamery yogurt is made with fresh, non-homogenized milk from 100% grass fed cows. Maple Hills’ organic, creamline yogurt is made without thickeners, is flavored with fresh fruit puree, low in added sugar and tastes very natural. Discover the way of the Grass Fed Cow at This Link. 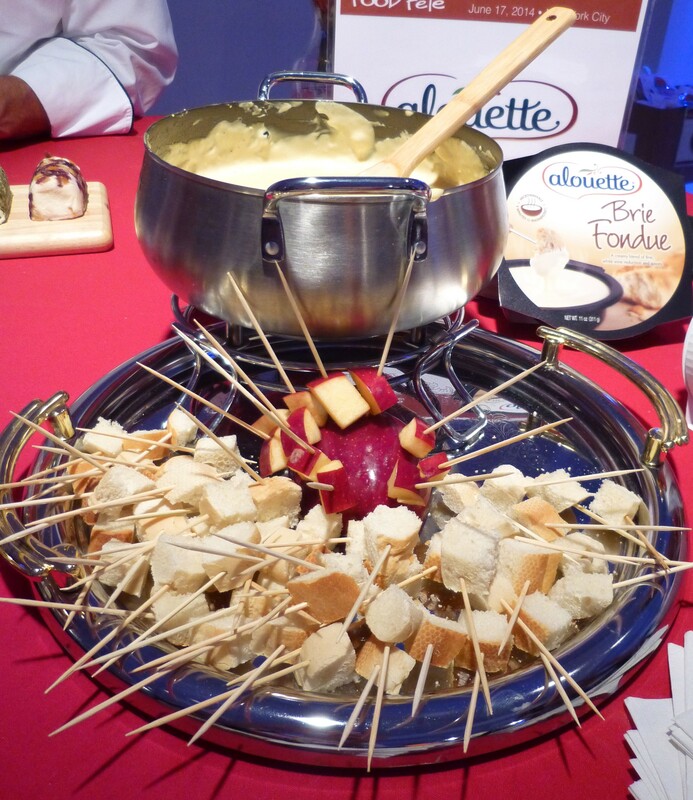 Alouette Brie Fondue, in Stores from October to December 2014. 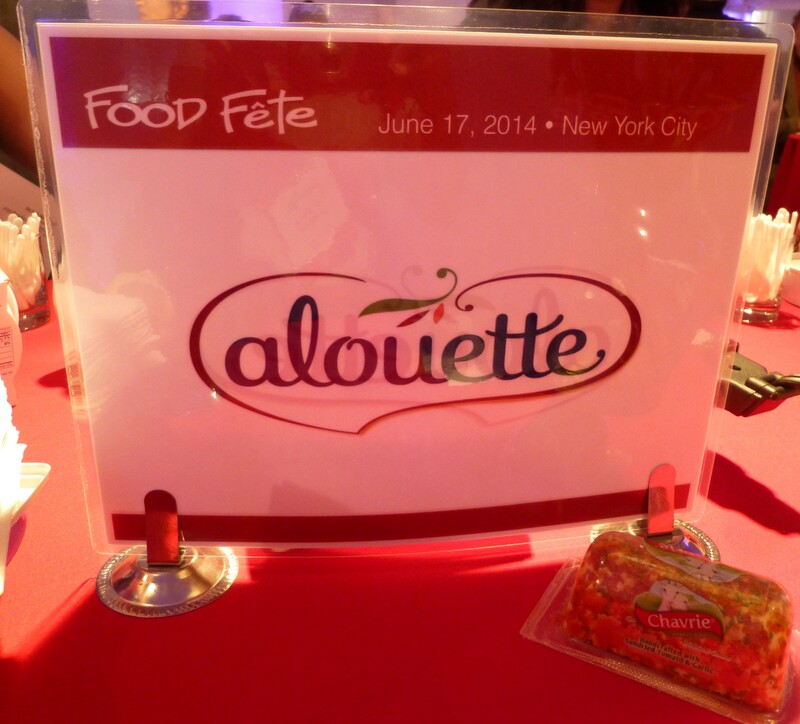 Alouette Cranberry Apple Spice Soft Spreadable Cheese, in Stores from October to December 2014. Crème de Brie Smoky Bourbon, a creamy rind-less brie that blends real bourbon with subtle, smoky notes – great to spread on a baguette, cracker or as a dip for Veggies! In stores beginning in October. 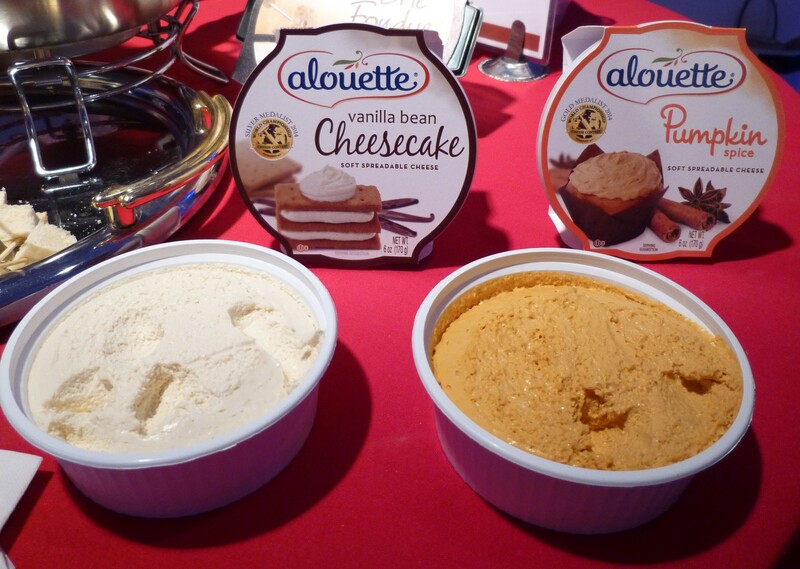 Find out more about Alouette products at This Link. 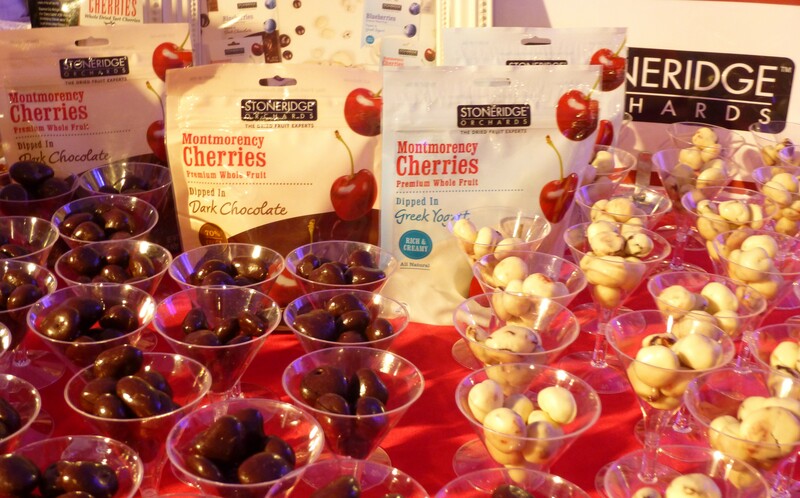 Stoneridge Orchards – America’s premier grower and producer of premium dried fruit – handed out tasting samples of their Dark Chocolate and Greek Yogurt Dipped Cherries, and are those ever a luxurious treat. Stoneridge Orchards also introduced their innovative new dried fruit snack: Chili Lime Cherries with Tajin (a Mexican seasoning blend containing chile peppers, lime, and salt). Stoneridge uses whole dried tart Montmorency Cherries in their cherry snacks which are plump, moist and very delicious. Visit them on the web at Stoneridge Orchards Dot Com. Food Fête Attendees had the chance to taste Chef Pasquale Martinelli’s Peacock Brown Rice Spaghetti alla Sanguiannid, which was delicious. 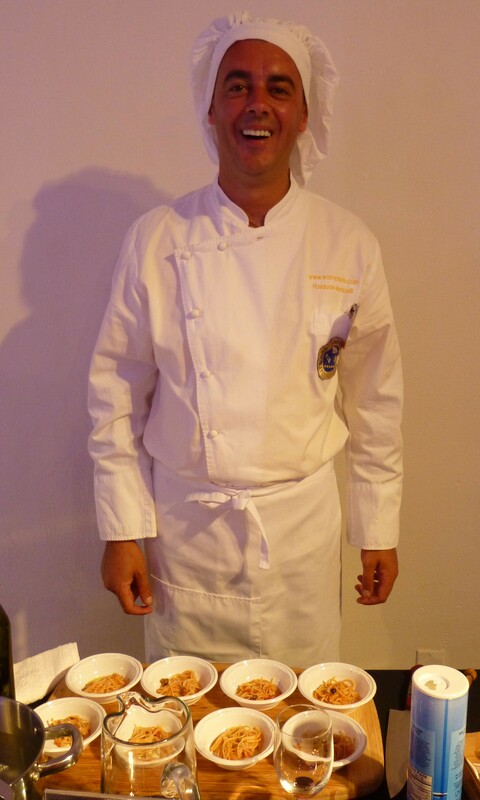 Chef Pasquale did a fantastic job of highlighting the versatility of Singaporean Peacock Noodles with his traditional Italian cooking. 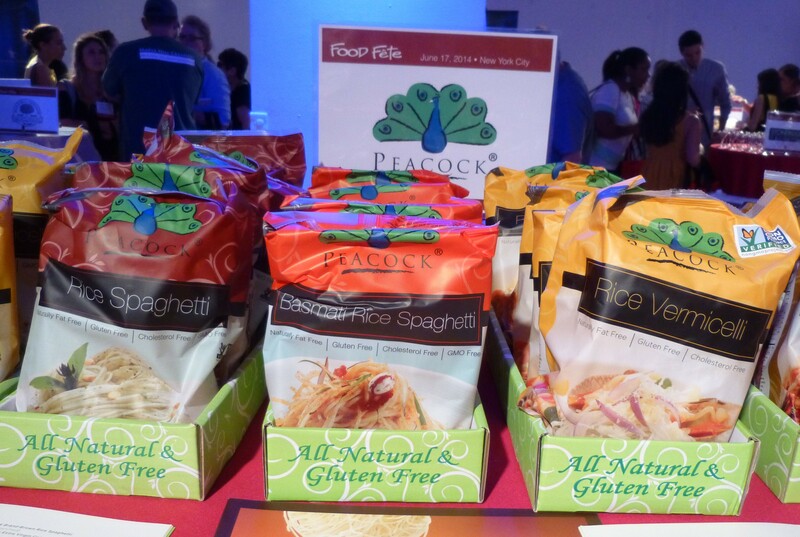 The Peacock brand features a variety of pastas including brown rice and basmati rice noodles. Get to know this Singapore-based brand a bit better by visiting This Link. We’ll wind this all up with a few words about something sweet in the form of Gearharts Fine Chocolates’s Peanut Butter Pups. 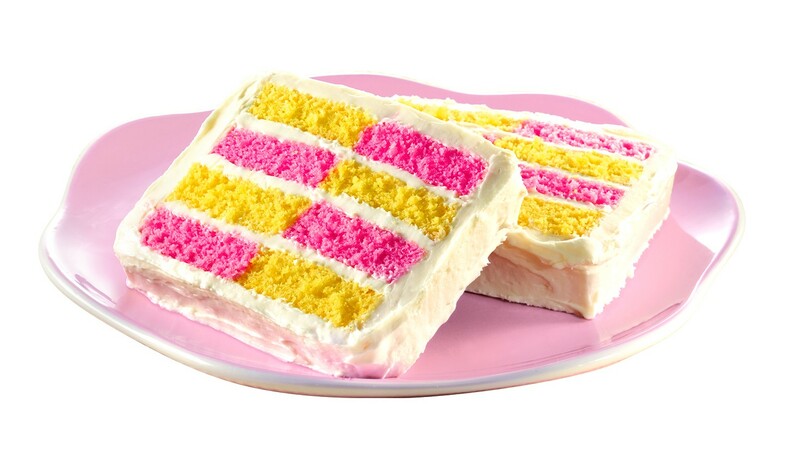 What an indulgent – and adorable – treat! 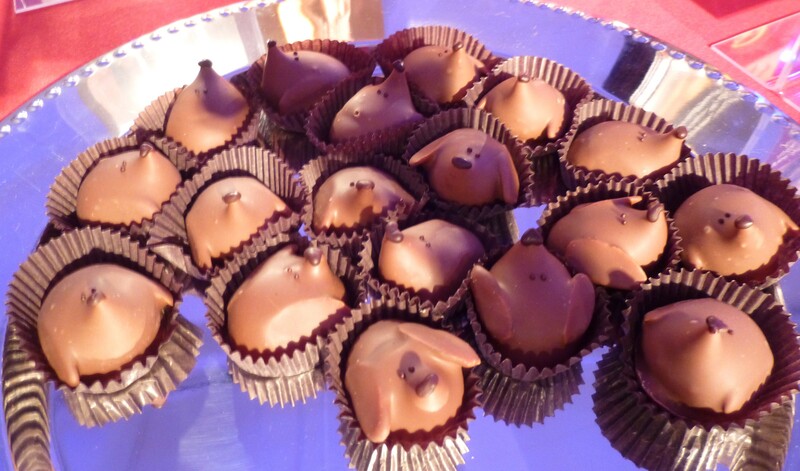 These whimsical, hand-piped Puppy Heads are made from premium milk chocolate and Virginia artisan peanut butter, and decorated with a dark chocolate face and toasted almond ears. So cute! So, so delicious! If you are a chocolate and peanut butter fan, this right here is your thing. 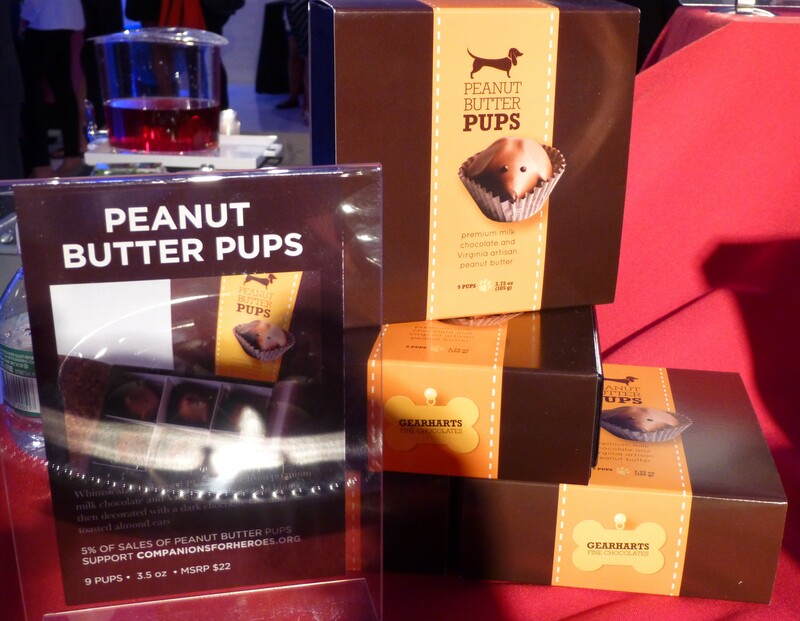 Plus, 5% of sales of Peanut Butter pups support Companions for Heroes.org. 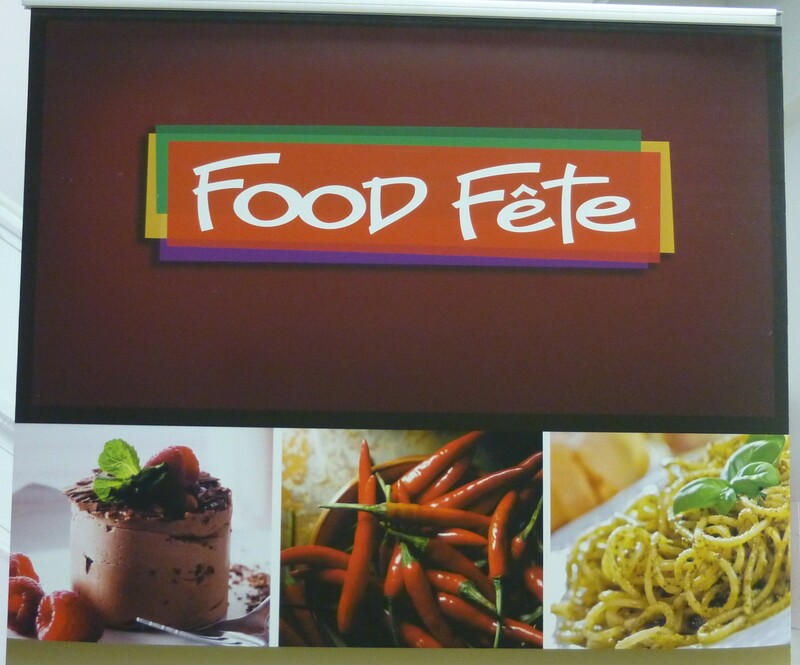 Thanks as always to Jeff Davis at Food Fête for providing an introduction to so many great products! See you in the fall! Four times each year we get very excited in anticipation of our favorite food trade show, Food Fete, because it is so awesome. 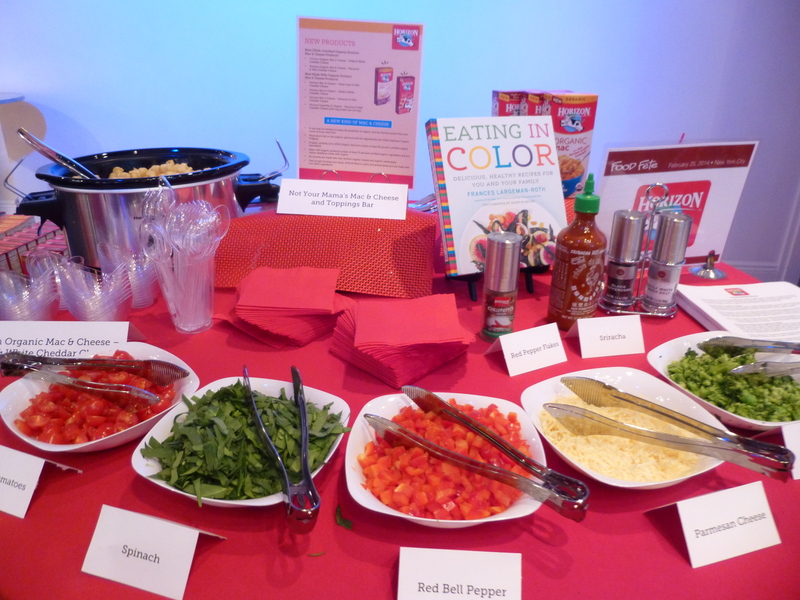 Winter Food Fete took place last week on February 25th and while it was on the small side, we discovered plenty of cool new products to tell you about. Our first stop is the bar, where a featured vendor is always mixing up signature cocktails spiked with their potent potable. 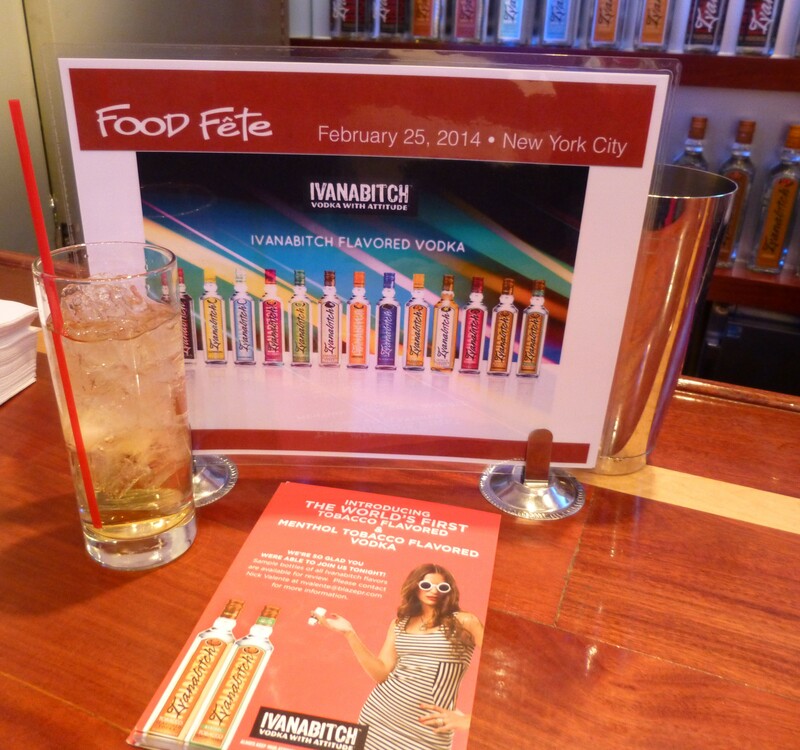 This season we discovered Ivanabitch: Vodka with an Attitude, which comes in 13 flavors, including Tobacco and Menthol Tobacco — which we imagine is popular with the smokers! We were not brave enough to sample the Tobacco flavors (though we were informed its taste is more “inspired by” the leaf than actually replicating it) but we did very much enjoy the delicious Peach Vodka cocktail you see pictured above. Produced in The Netherlands, Ivanbitch is comparable quality-wise to Ketel One, which is our favorite vodka! Needless to say, but you can see I am about to, we are looking forward to trying their additional delicious flavors, such as Red Berry, Dutch Apple and Coconut. Check them out at Ivanabitch Dot Com. Seattle’s Best Coffee co-hosted the bar with its Maple-Tini, made with SB Coffee, Maple Syrup, Vanilla Vodka and Half & Half. 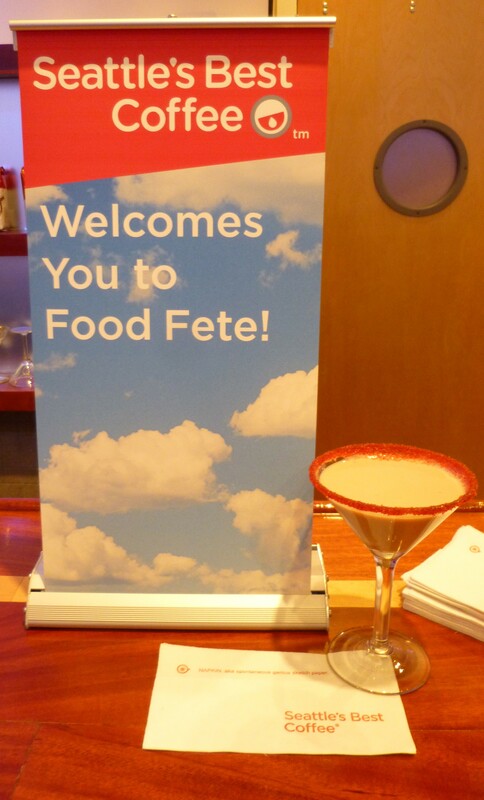 This seasonably appropriate cocktail was a big hit with the crowd and we made sure to pick up a recipe card available at the booth. 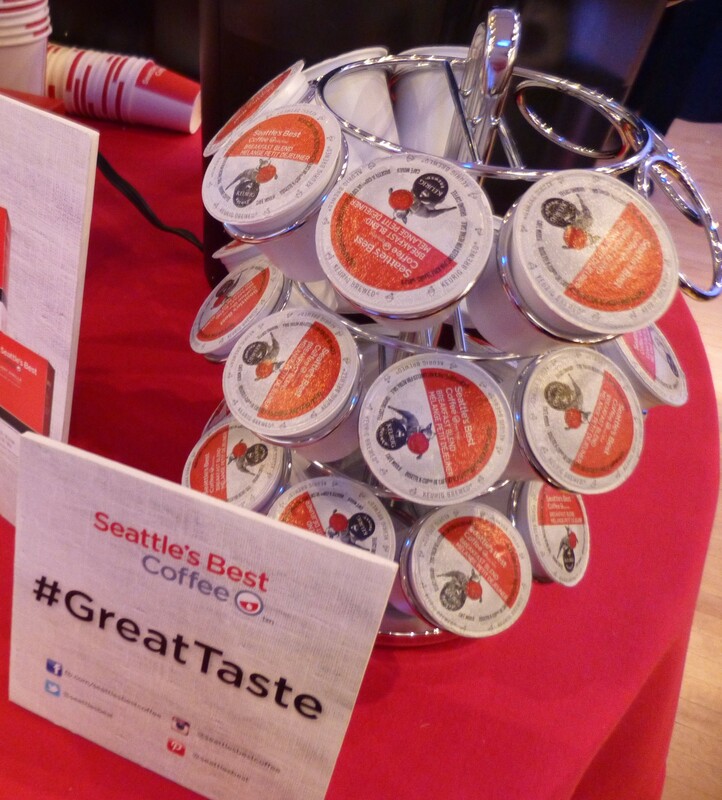 When we are in Seattle, Seattle’s Best Coffee is our preferred brand to pick up on-the-go, so we made sure to take home a few of their Keurig cups to enjoy at home. Delicious! Look at this amazing display from the folks at Burpee! 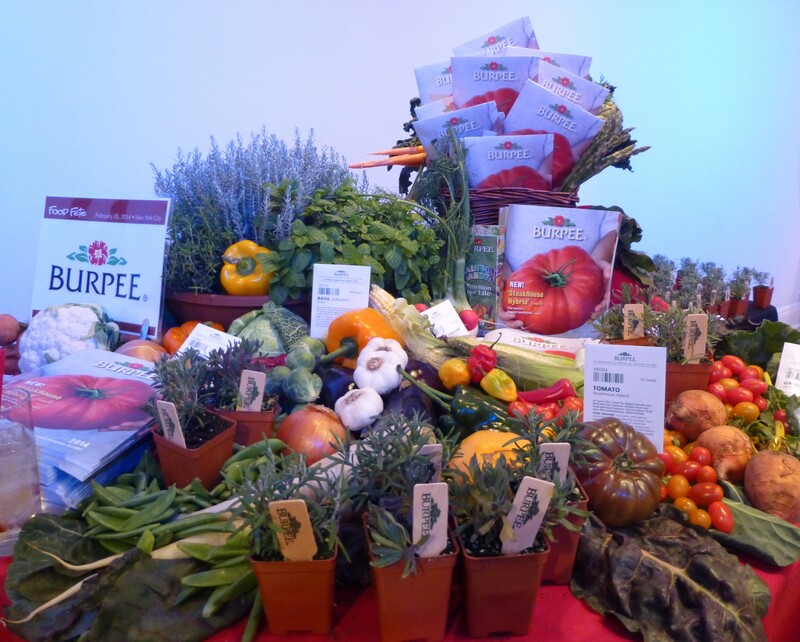 Legendary for its seeds, plants and gardening supplies, Burpee has been around since 1876! Wow! These days, Burpee has all kinds of cool and innovative ideas for home gardening/farming even in a small space or indoors! Find out more about their vast selection of products, see photos of the World’s Largest Tomato and request a Burpee product catalog at This Link. 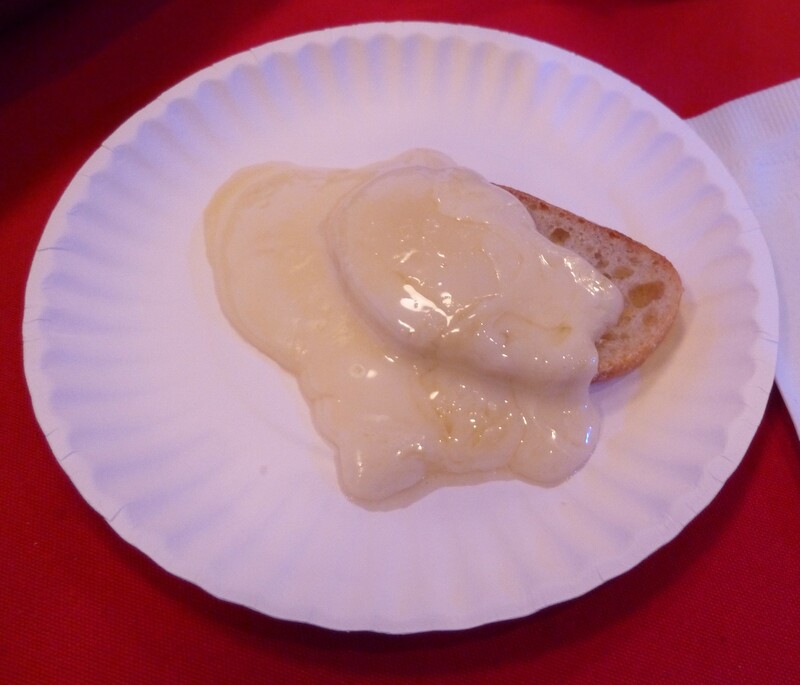 Mmm…delicious melty Cheese. 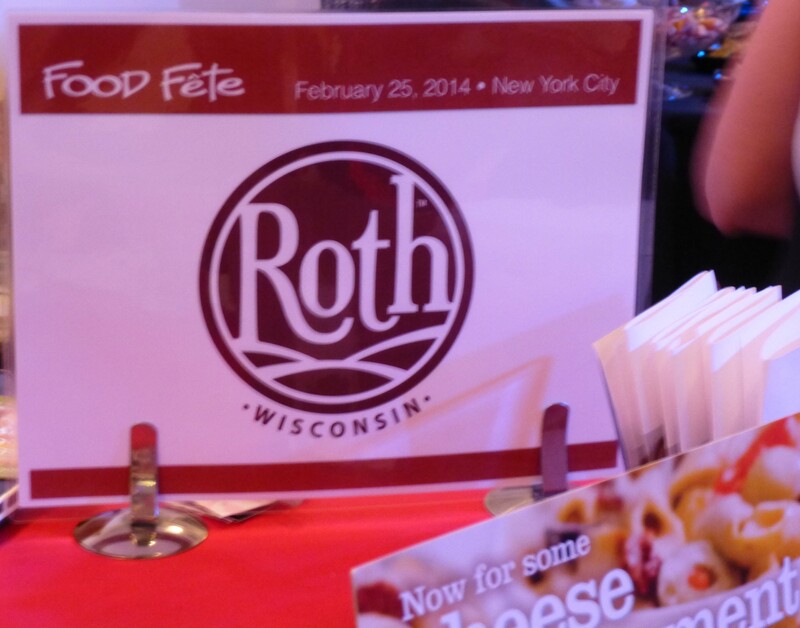 Roth Wisconsin Gourmet Cheese hosted a popular booth where they gave out samples of their insanely fantastic new Raclette Cheese (available in bold flavors like 5 Peppercorn, Roasted Garlic and Mediterranean with Sun Dried Tomatoes) which will be available in stores in the Spring. To serve the cheese, they first melted it in little iron skillets before draping it onto tiny slices of bread. Best. Cheese. Ever. It is no surprise to discover that Roth is part of Emmi, the company that makes the most awesome Cheese and Chocolate Fondues. Go a little crazy with the cheese love at This Link. 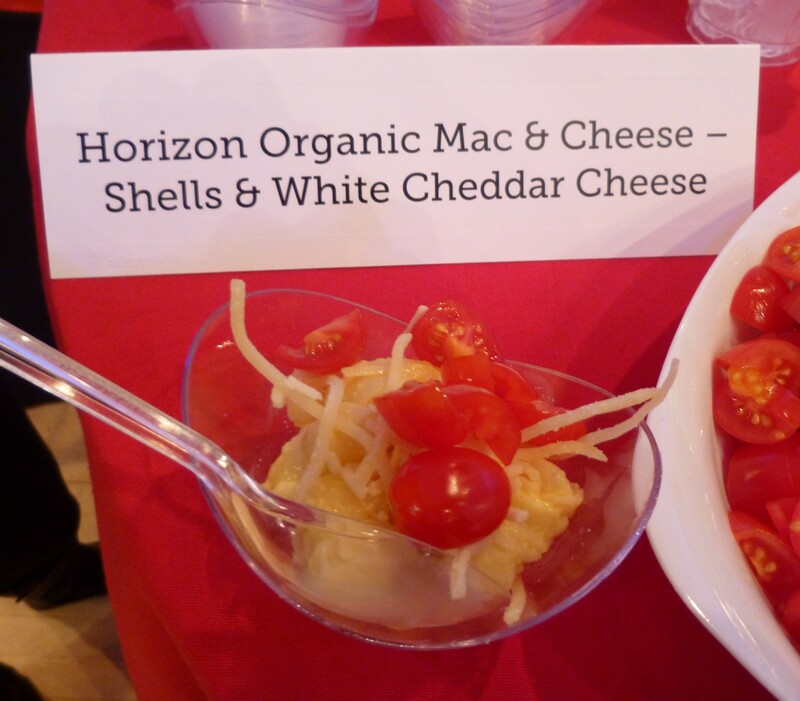 Another one of our favorite Booths was hosted by Horizon Mac & Cheese. Their Not Your Mama’s Mac & Cheese and Toppings Bar was an amazing idea executed to perfection as they invited Food Fete attendees to sample their organic White Cheddar Shells & Cheese dinner, which could then be topped with a variety of fresh add-ins including Chopped Tomatoes, Fresh Spinach, Red Bell Pepper and Shaved Parmesan Cheese. What a treat! So Yummy. Horizon products are available Nationwide. Visit their website at Horizon Dairy Dot Com. Do you enjoy delicious chips? 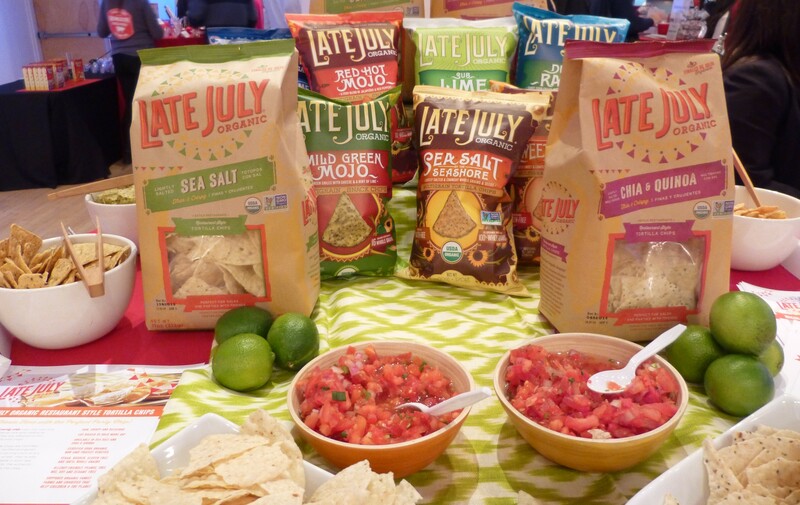 If so, may we recommend Late July brand organic (and gluten free) Restaurant Style Tortilla and Multigrain chips, which come in a variety of appealing flavors like Sea Salt, Lime and Mild Green Mojo — half a large bag of which I have eaten while writing this post. Late July Chips are crispy, light, delicious — and when served with a bowl of fresh salsa (the one pictured here is from Whole Foods) or guacamole (alongside a chilled Cerveza) will make you feel like you are eating in your favorite Mexican restaurant! We also enjoy the name, Late July, which makes us nostalgic for summer weather that can’t come soon enough! See those English Muffins up there? We made an egg sandwich with one the other morning that was just crazy good. 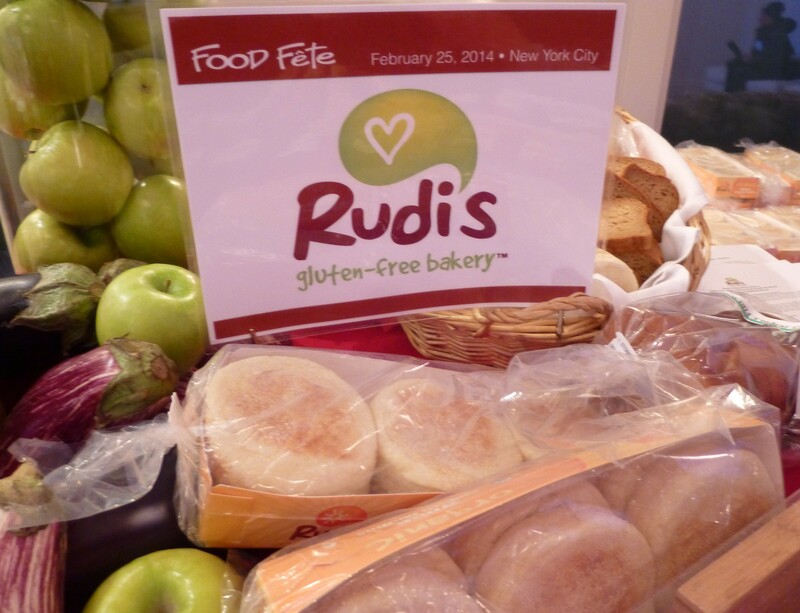 Rudi’s Gluten-free Bakery not only offered samples of its delightful freshly baked Sandwich Bread and traditional English Muffins but also gave away whole packages to take home. Get a coupon for $1 Off your purchase of any Rudi’s Bread product, so you can try it for yourself, at This Link. Ah, Cascadian Farm Organic, the subject of one our very Favorite Worleygig.com Posts of the past! What fun it was to run into them again at Food Fete, where they were promoting their new Protein enriched Chewy Snack Bars! Each of these indulgent bars packs 9 Grams of organic, plant-derived Pea Protein. Impressive! The Peanut Butter Chocolate Chip variety tastes like a Peanut-studded, Peanut-buttery Rice Crispy Treat, for a taste and texture that stands out from the legion of Snack Bars we have written about on The Gig. Much healthier for you and just as satisfying as a Snickers Bar! 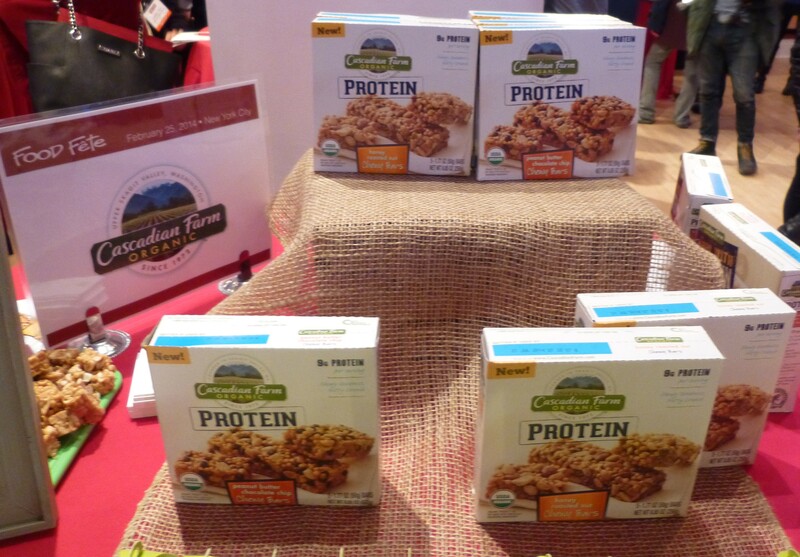 Discover the joy of Cascadian Farm healthy Snacks at Cascadian Farm Dot Com. Are you thirsty? 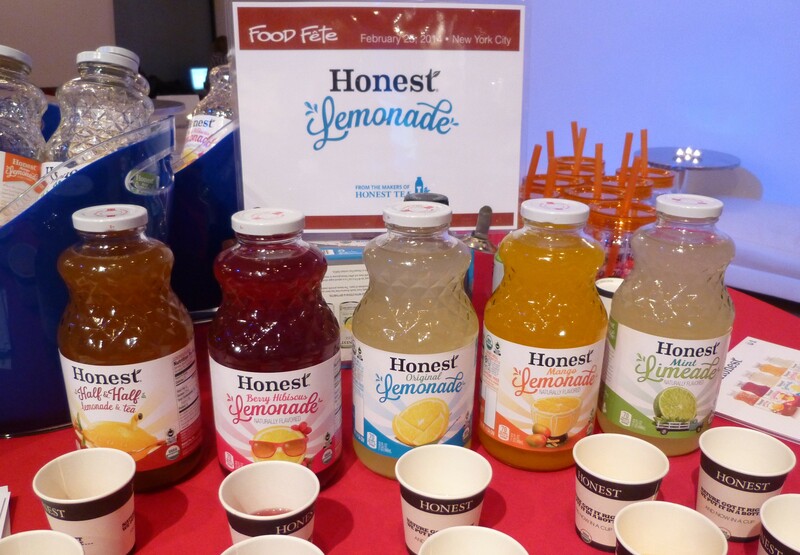 Honest brand Lemonade (they also make Honest Tea, get it?) previewed a line of flavored Lemonade and Limeade drinks in family-size, retro style glass bottles. They have a new Half & Half (also known as an Arnold Palmer, after the famous Golfer) which is a popular blend of Ice Tea and Lemonade in one bottle, plus Mango and Berry Hibiscus Lemonades. All very refreshing! 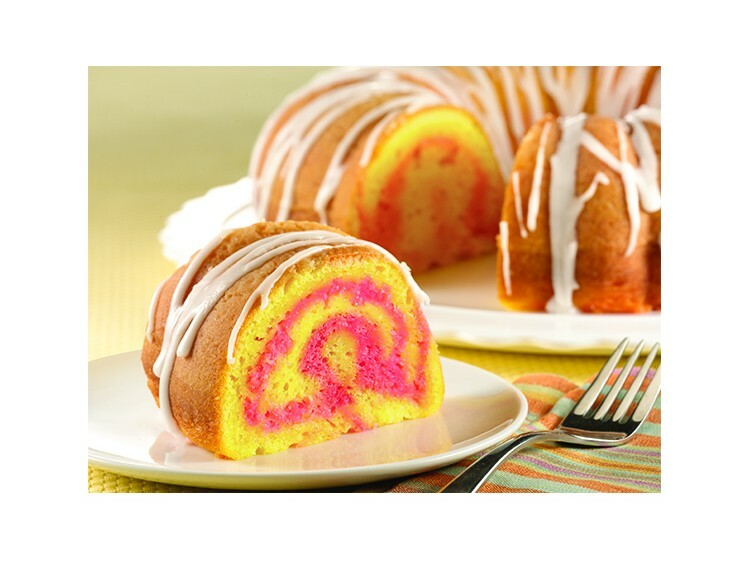 Just because Duncan Hines brand cakes mixes have been around since you were an egg doesn’t mean they aren’t on trend. In fact, we’d say they are even a little bit ahead of the curve with three new baking mixes introduced at Food Fete: Blue Velvet and Pink Velvet Cake Mixes and Salted Caramel Brownie Mix! Holy Sweet Surrender! 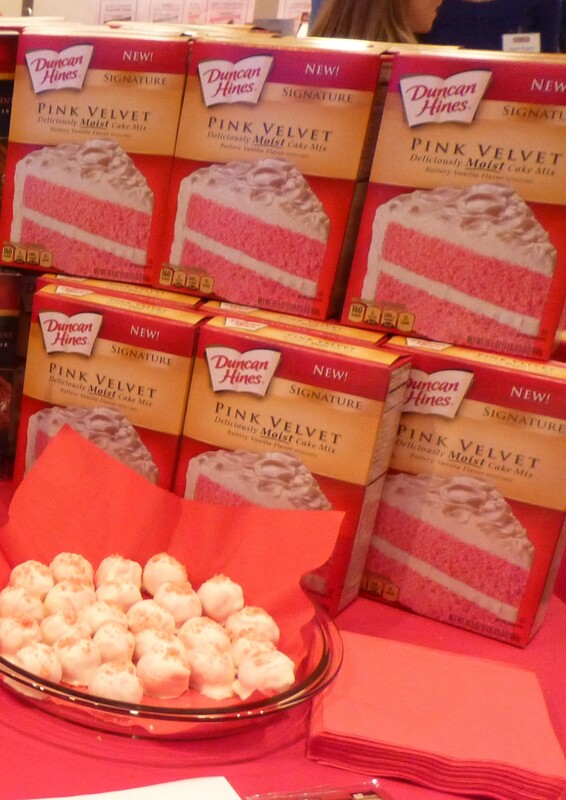 The Duncan Hines booth served tiny cake balls and brownie bites (recipes come on the back of each box) that we could not resist, and practically forced us (though they did not have to try too hard, because: Pink Cake) to take a box of Pink Velvet cake mix to bake at home. Duncan Hines, For The Win! When you think Yoplait, you think Yogurt, right? Right! 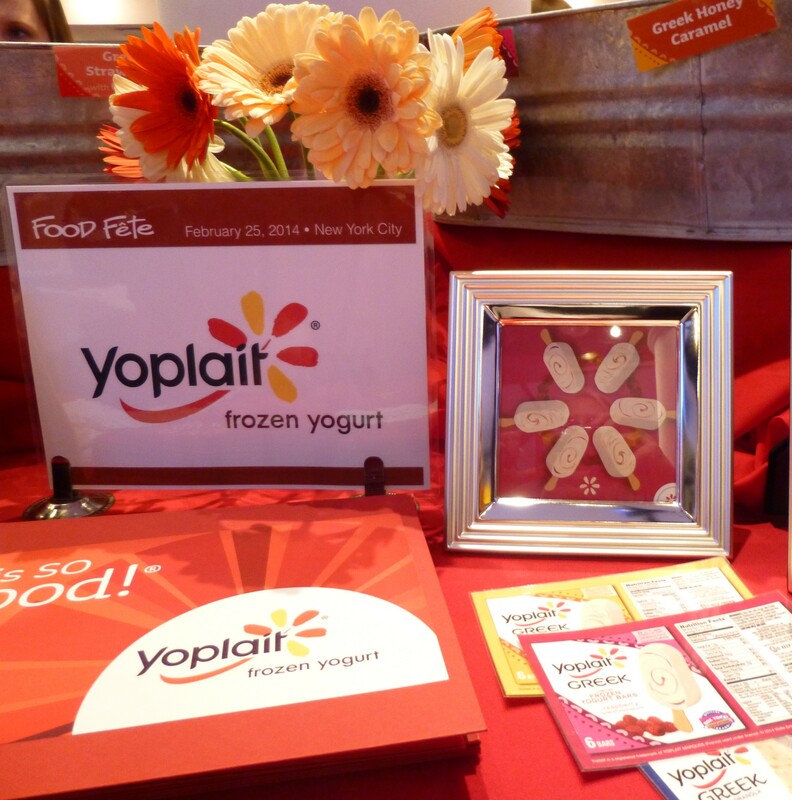 The latest addition to the Yoplait Yogurt and Frozen Yogurt Dessert family is their collection of Greek Frozen Yogurt Bars with Granola, which will debut in Spring 2014. Fancy! 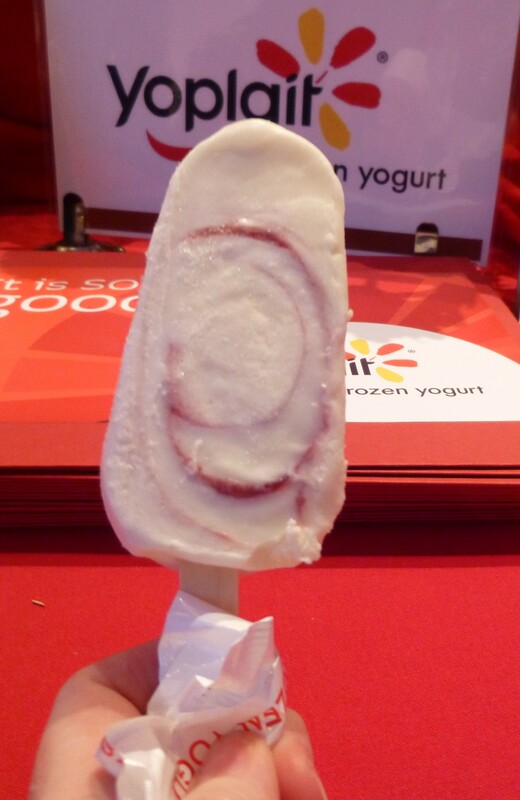 This is a picture of my hand holding a non-granola-embossed Yoplait Greek Frozen Yogurt Bar in the Raspberry Flavor. Doesn’t it look good? 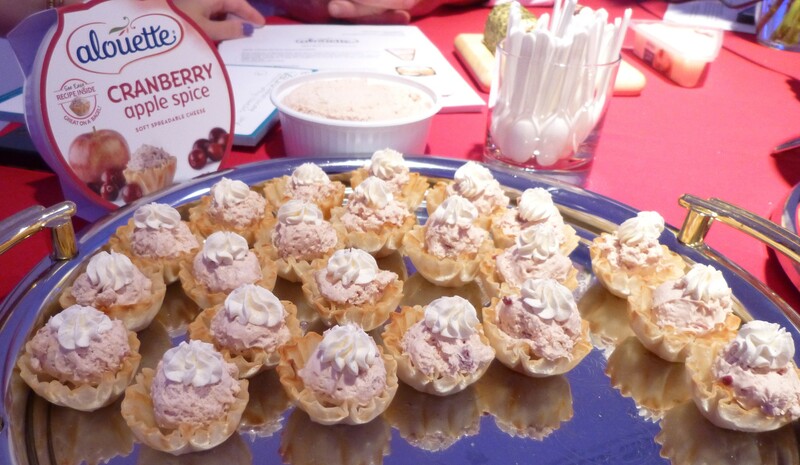 It tastes like a frozen creamy cheese cake with swirly fruit in it. After about a dozen licks of my tongue this bar escaped from its stick and flung itself onto the ground at the feet of the nice woman who was tending the Seattle’s Best Coffee Booth. She was kind enough to lift it from the floor into a napkin and dispose of it in the bin. Sadness! Anyway, you should check out these tasty bars of frozen goodness! Look! 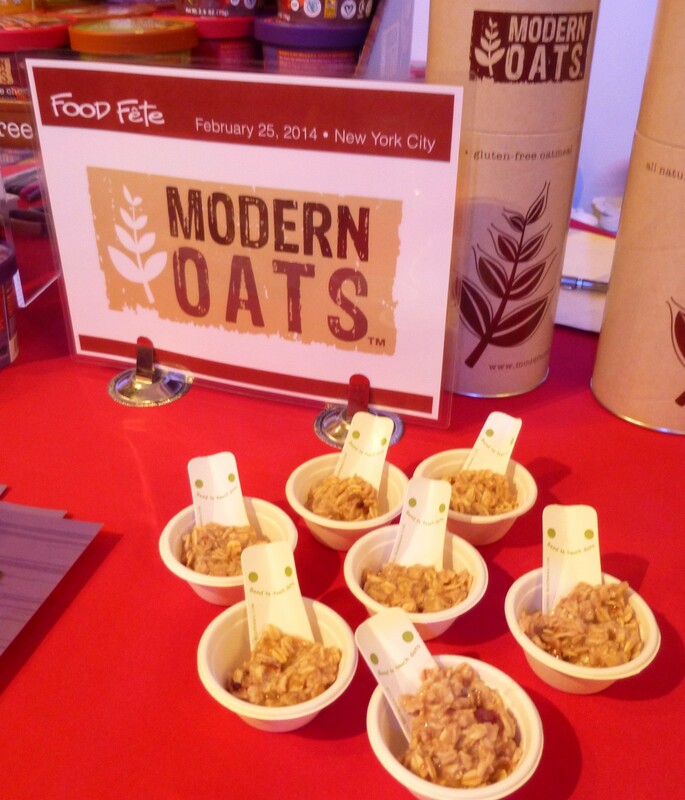 Happy Little Spoons ready to serve up warm tasty samples of crunchy fruit-laden Modern Oats oatmeal. 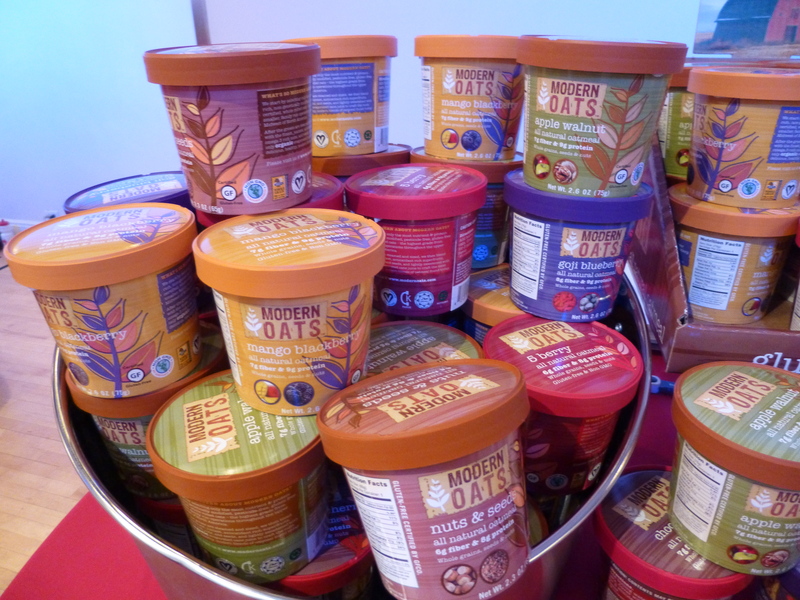 Modern Oats, which cooks with the addition of Boiling Water in just 3 Minutes and is of course Gluten free and Non GMO comes in crazy rad tasty flavors like Mango Blackberry (which we tried; Yum) and Chocolate Cherry! Perfect for Breakfast on the go or to take to the office! 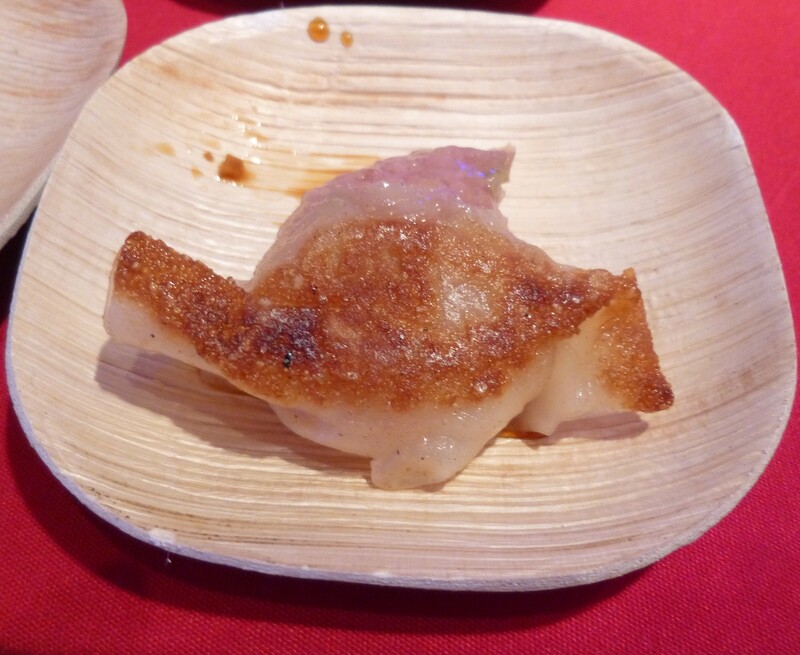 And that wraps up our report on Winter Food Fete, another great and fun food show! Thanks to Jeff Davis as usual. See you for the next event in April!